It’s inevitable that our entrepreneurial journey will result in a few shifts and changes. After being in business for a while, you may look back on the early stages of business and barely recognize yourself (or your business). But if you’re not taking the time to strategically evaluate how you change, you might run into problems. Episode 15 of The Leadership Forum dives into what to do when you’ve evolved as an entrepreneur. 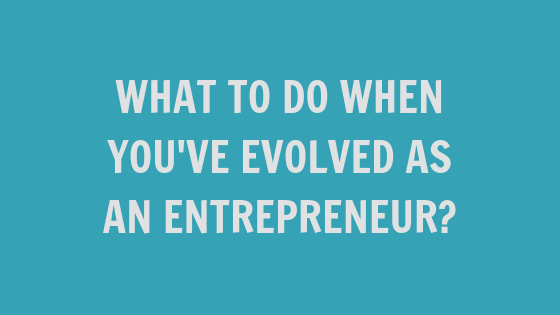 What it means to be an “evolved” entrepreneur? 00:00 – 2:45: Welcome and Introduction! 2:45 – 14:32: Taking the time to look back and reflect upon our accomplishments before we look ahead. 14:32 – 23:55: Pulling back the curtain and humanizing the business. 23:55 – 33:33: The pitfalls of the evolutions of an entrepreneur. 33:33 – 41:00: Mindset and growth. 41:00-48:50: How does the process work in the evolution of business? 48:50-54:23: We are not telling you to re-invent the wheel – slight adjustments to your business. 54:23-1:00: Evolved Entrepreneur Challenge & Wrap-Up. As entrepreneurs, we naturally spend a lot of time looking ahead. We wonder what we need to do next, where we are going, and what we’re missing. We set new goals and shift our offers and plan for the next big thing. But if we want to truly see the big picture, we need to look backward and forward. It’s important to look back and reflect upon how we’ve grown (and make sure our message is up-to-date). If you’ve ever suffered from website shame or cringed when someone downloads a lead magnet you wrote two years ago, you know what I mean. Having an up-to-date message means all of your content is working in sync to reflect where you are now. To do this, we need to look at what we’ve mastered and changed in the past, so we can strategically moved forward. Whether slight or drastic, businesses change all the time. Sometimes this happens naturally. In other instances, we are more intentional about it (think: rebrand). Regardless, when we allow our clients to see the process we invite them to be a part of our growth. By pulling back the curtain and showing our growth, our audience comes along for the ride. 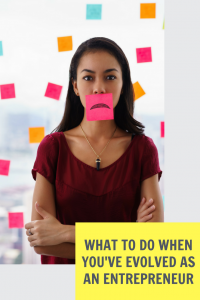 This can help them feel more invested in your brand and your personal journey, and lead to far less confusing outcomes than an overnight rebrand. Time: As entrepreneurs, we are always on the go, and often we don’t take the time to update our message to match our evolution. As a result, our business feels disjointed and confuses our audience. Fear: We’re programmed to resist change, and when we realize it’s happening (even when it’s a good thing!) fear can crop up and stop us in our tracks. Instead of embracing change, we end up sitting in discomfort. Inaction: That fear can breed a lack of action. We end up sitting in the middle of the path forward instead of following it, and everything comes to a grinding halt. When you’ve evolved as an entrepreneur, you’re going to face a fair amount of mindset work. Your brain might be screaming at you to slow down, stop thinking so much of yourself, and go back to the way things were. It can feel scary and hard to step into the next iteration of your business, but that doesn’t mean you’re going to fail. And even if you do fail it doesn’t mean you’ve kicked off the apocalypse. Keep things in perspective and do the mindset work. If you need a place to start, I highly recommend watching this video interview with Lisa Carpenter (start around the 25-minute mark).